Identify the three main parts of the nut splitter. First is the tightening screw located at the end of the handle. The other main parts are located in the wider top part of the nut splitter. Inside the boxy shape is a molded point, or breaker point. Coming out of the handle and into the boxy part is a small metal push pad on a rod. This rod extends and retracts according to how the tightening screw is turned. You want to fit your nut between the breaking point and the push pad. Move the push pad away from the breaking point by turning the screw counter-clockwise. Place the nut splitter around the nut. You want to pull the nut splitter so the breaking point is pressed against the nut. You also want to make sure that you have enough room to turn the tightening screw with a crescent wrench. 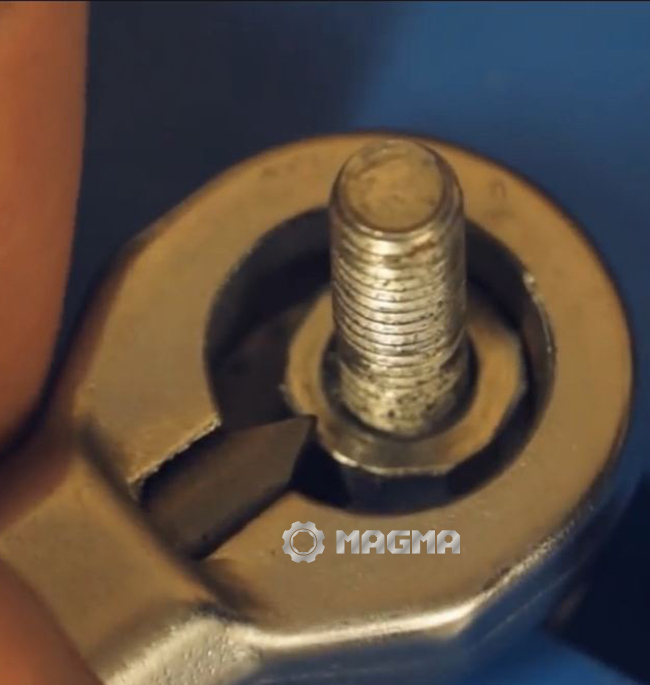 Move the handle of the nut splitter until it is in a position where you can easily use the wrench on the screw. Tighten the screw by turning it clockwise with your crescent wrench. Even though this is referred to as a "screw," the end of it is not slotted for a Phillips-head or flathead screwdriver but made like a kind of nut itself. Tighten your crescent onto the screw and turn it clockwise. As you do this, the push pad will push against the frozen nut and begin to press the breaking point into the nut from the other direction. After a certain amount of pressure, the nut will break.